Fluid-applied waterproof materials are solvent-based mixtures containing a base of urethanes, rubbers, plastics, vinyls, polymeric asphalts, or combinations thereof. Fluid membranes are applied as a liquid and cure to form a seamless sheet. Since they are fluid applied, controlling thickness is critical during field application (see Fig. 2.47). Therefore, field measurements must be made (wet or dry film) for millage control. The percentages of solids in uncured material vary. Those with 75 percent solids or less can shrink, causing splits, pinholes, or insufficient millage to waterproof adequately. Fluid systems are positive waterproofing side applications and require a protection layer before backfilling. Fluid-applied systems are frequently used because of their ease of application, seamless curing, and adaptability to difficult detailing, such as penetrations and changes in plane. These systems allow both above- and below-grade applications, including planters and split-slab construction. Fluid systems are not resistant to ultraviolet weathering and cannot withstand foot traffic and, therefore, are not applied at exposed areas. 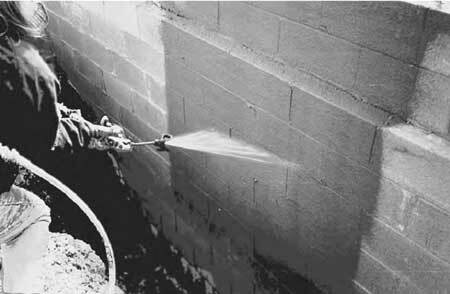 FIGURE 2.47 Spray application of fluid-applied membrane. Several important installation procedures must be followed to ensure performance of these materials. These include proper concrete curing (minimum 7 days, 21–28 days preferred), dry and clean substrate, and proper millage. Should concrete substrates be wet, damp, or uncured, fluid membranes will not adhere and blisters will occur. Proper thickness and uniform application are important for a system to function as a waterproofing material. Materials can be applied to both vertical and horizontal surfaces, but with horizontal applications, a subslab must be in place so that the membrane can be applied to it. 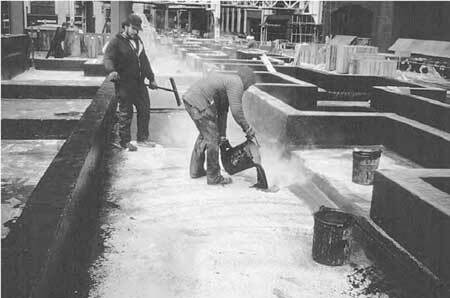 A topping, including tile, concrete slabs, or other hard finishes, is then applied over the mem- brane. Fluid materials are applicable over concrete, masonry, metal, and wood substrates. Note the application to below-grade concrete block wall in Fig. 2.48. Fluid-applied systems have elastomeric properties with tested elongation over 500 percent, with recognized testing such as ASTM C-836. This enables fluid-applied systems to bridge substrate cracking up to 1 16-in wide. 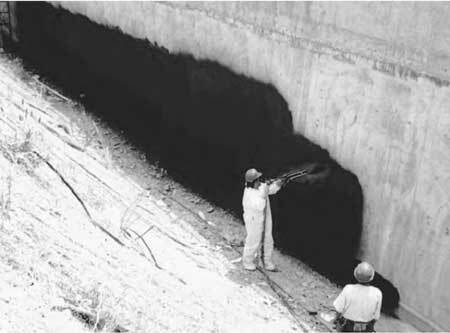 FIGURE 2.48 Fluid-applied membrane application to below-grade block wall. An advantage with fluid systems is their self-flashing installation capability. This application enables material to be applied seamless at substrate protrusions, changes in planes, and floor-wall junctions. Figure 2.49 details a typical below-grade application using fluid membranes. Fluid materials are self-flashing, with no other accessories required for transitions into other building envelope components. However, a uniform 50–60 mil is difficult to control in field applications, and presents a distinct disadvantage with fluid systems. FIGURE 2.49 Typical below-grade application detailing for fluid-applied membranes. These systems contain toxic and hazardous chemicals that require safety protection during installation and disposal of materials. Refer to Chap. 14 and the discussion on V.O.C. materials. Fluid-applied systems are available in the following derivatives: urethane (single or two-component systems), rubber derivatives (butyl, neoprene, or hypalons), polymeric asphalt, coal tar, or asphalt modified urethane, PVC, and hot applied systems (asphalt). Urethane systems are available in one- or two-component materials. Black coloring is added only to make those people who believe waterproofing is still “black mastic” comfortable with the product. Urethanes are solvent-based, requiring substrates to be completely dry to avoid membrane blistering. These systems have the highest elastomeric capabilities of fluid-applied membranes, averaging 500–750 percent by standardized testing. Urethanes have good resistance to all chemicals likely to be encountered in below-grade conditions, as well as resistance against alkaline conditions of masonry substrates. Rubber derivative systems are compounds of butyls, neoprenes, or hypalons in a solvent base. Solvents make these materials flammable and toxic. They have excellent elastomeric capability, but less than that of urethane membranes. Rubber systems are resistant to environmental chemicals likely to be encountered below grade. As with most fluid membranes, toxicity requires safety training of mechanics in their use and disposal. A chemical polymerization of asphalts improves the generic asphalt material qualities sufficiently to allow their use as a below-grade waterproofing material. Asphalt compounds do not require drying and curing of a masonry substrate, and some manufacturers allowinstallation of their asphalt membranes over uncured concrete. However, asphalt materials are not resistant to chemical attack as are other fluid systems. These membranes have limited life-cycling and are used less frequently than other available systems. Coal tar and asphalt-modified urethane systems lessen the cost of the material while still performing effectively. Extenders of asphalt or coal tar limit the elastomeric capabilities and chemical resistance of these membranes. Coal tar derivatives are especially toxic, and present difficulties in installing in confined spaces such as small planters. Coal tar can cause burns and irritations to exposed skin areas. Field mechanics should take necessary precautions to protect themselves from the material’s hazards. Solvent-based PVC or plastics are not extensively used in liquid-applied waterproofing applications. These derivatives are more often used as sheet membranes for roofing. Their elastomeric capabilities are less than other fluid systems and have higher material costs. They do offer high resistance to chemical attack for below-grade applications. Hot-applied systems are improvements over their predecessors of coal tar pitch and felt materials. These systems add rubber derivatives to an asphalt base for improved performance, including crack-bridging capabilities and chemical resistance. Hot systems are heated to approximately 400°F in specialized equipment and applied in thickness up to 180 mil, versus urethane millage of 60 mil (see Fig. 2.50). Asphalt extenders keep costs competitive even at this higher millage. These materials have a considerably extended shelf life compared to solvent-based products, which lose their usefulness in 6 months to 1 year. FIGURE 2.50 Application process for hot-applied membrane. Since these materials are hot-applied, they can be applied in colder temperatures than solvent-based systems, which cannot be applied in weather under 40°F. Manufacturers often market their products as self-healing membranes, but in below-grade conditions this is a questionable characteristic. Properties of typical fluid-applied systems are summarized in Table 2.5.